Last year, American cyclo-cross fans probably wouldn't have recognized her name. But this year Maghalie Rochette from Quebec has captured their attention with third place at Rapha Super Cross Gloucester and second at Rochester's Ellison Park Full Moon Vista event. Now in her third and most consistently successful year of UCI 'Cross competition, the Luna Pro Team rider also won The Night Weasels Cometh, a big non-UCI event in New England. She's 21 years-old. 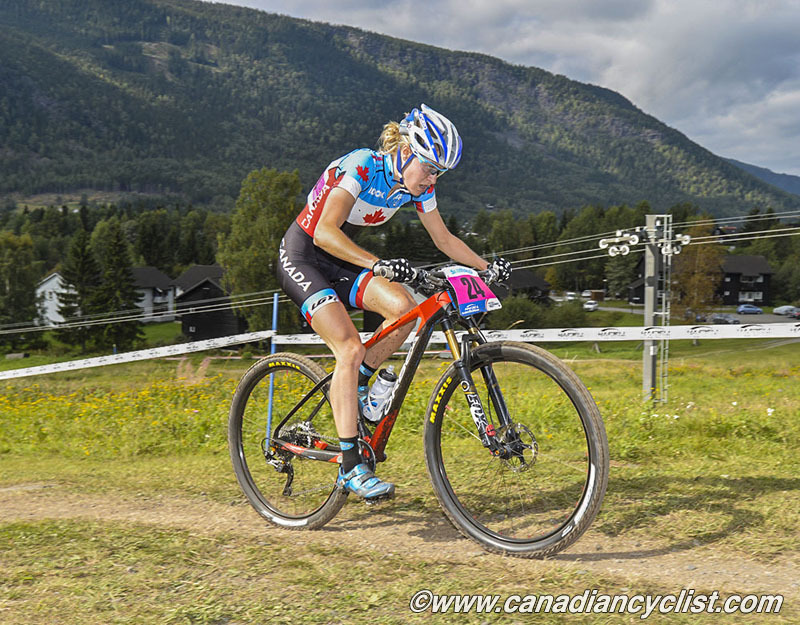 After completing her second elite mountain bike season in September and feeling more content with the experience than her overall results, Rochette opted for a relaxed approach to 2014 'Cross competition. "I just wanted to have some fun, to go all-out in 'Cross races and try to have some good results," she said. "But I didn't really have results in mind. I was just going out there to have a blast...but [results] arrived so I am super happy." Now she hopes that success will carry over to Canada this coming weekend when she tackles the Canadian cyclo-cross championships in Winnipeg and looks for a better outcome in her third run at the elite women's contest. In 2012 she finished thirteenth. Last year she came into the race two weeks after a bad crash and placed ninth. Her goal for Winnipeg is to pass the finish line happy with her performance. "I'm not thinking about a position so much because it's hard to decide if a race is good based only on that - you can't control what the other racers are doing," Rochette said. "So even if I have the best day of my life, and six other girls also have the best day of their lives and they beat me, I can't be disappointed with that." Perhaps she selects that perspective because she knows a twist of fate can change everything. After all, her athletic ambitions didn't begin with cyclo-cross. Growing up in Saint-Jérôme, a community just north of Montréal near forested trails, ski stations, and lakes, she initially played on bikes like most kids. Meanwhile, Dad raced mountain bikes and triathlons. Rochette's older sister competed in triathlons too. The family attended races together, with Mom cheering. Starting at age eight Rochette shredded at local mountain bike events. Four years later she jumped into triathlons to emulate her sister and subsequently picked triathlon when conflicting schedules drove her to one sport. She advanced to Junior elite national and international levels. Like every sport she wanted to try - from soccer and basketball to skiing, karate, and dancing, her parents supplied ample encouragement. "They came to every race, traveling around Quebec to get me and my sister to races," she said. "They were really, really supportive and still are." Then around age 15, while practicing transitions barefoot in a park, a shard of glass sliced through the bottom of one foot. After four stress fractures it was clear the foot couldn't withstand intense running, though cycling was fine. She dropped triathlon at 18 and experimented with racing bikes on the road. In 2011 a friend invited her along to a local 'Cross race in Quebec. "It was just a little crazy," she recalled. "I bought a bike the night before, a super cheap bike, the only one I could afford." She pedaled to third place in a mixed women's field. Someone handed her a beer on the podium. She didn't drink it, but she soaked up the relaxed, festive atmosphere. "I had a blast and after that I was completely hooked." The next year she collected about a dozen top ten cyclo-cross results, primarily in the US. In January of 2013 she considered her future. "I thought I had a pretty decent 'Cross season for my first one. So I decided mountain biking could probably help me for cyclo-cross." She bought a mountain bike and flew at races. After her ninth place at mountain bike world championships, the Luna Pro Team signed her for 2014. Knowing her parents placed a high value on education, with their blessing she scaled back university plans from full to part-time to give her first pro year proper attention. "Before it was just pretty much me and my boyfriend and the trunk of our car. Luna was a big change and it took me a while to get used to it, but it was great," she said. "It was so much more pro." The step up brought visits to sponsors and communities. Alongside those responsibilities came seasoned teammates. Rochette learns from them, much like years ago when more experienced athletes like her older sister and girls on her triathlon team provided advice. Now Rochette feels it's now her turn to mentor others. She's an ambassador with Fast and Female, an organization dedicated to motivating girls to remain in sports and pursue a healthy lifestyle. Rochette and additional elite women cyclists will lead a Fast and Female event during the Shimano Canadian Cyclo-Cross Championships. "Being an athlete, for me I don't just want to get results. I also want to be an ambassador and bring something to the sport," Rochette said. "If we inspire one girl to stay in sports and be healthy and occupied by that, I think our job is done." 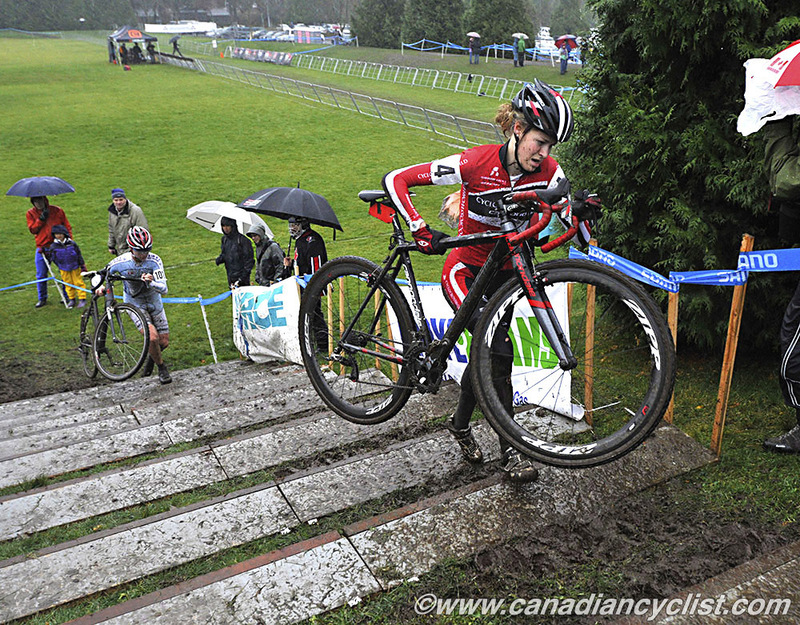 A student athlete herself, Rochette believes she has a lot to learn in cyclo-cross. Tactics and strategy rank high, she said, "and how to position myself with the group and see the race unfolding." She's also working on mud skills and seeks out the gooey stuff whenever possible. But luck alone hasn't landed the Canadian on UCI podiums. She attributes her rapid rise to pre-existing fitness and technical skills she acquired as a kid. "For me trying a new obstacle is mostly challenging, not scary," she explained. "So I don't really hesitate too much." She'll need every skill to compete at 'Cross nationals against a field containing last year's winner, friend and Luna teammate Catharine Pendrel. "Probably we won't be racing together," Rochette said about Pendrel. "We will be competitors. But we will play fair and we'll still be friends at the end."